Maureen said in an interview once that she was always doing a Tarzan picture while she was at Metro. The things were constantly in production, according to her. Well, that may be a little bit of an exaggeration, but we can surely appreciate the discomfort she must have experienced --- as valued correspondent Laughing Gravy pointed out in a comment to last week’s Maureen posting, it must have been pretty raw having to sit atop an elephant in that skimpy costume (speaking of elephants, that's Tarzan author Edgar Rice Burroughs standing in front of one with Maureen and Johnny). She used to regale Tom Snyder with horror stories about the chimps biting her as well. Whatever the money was, it probably wasn’t enough. 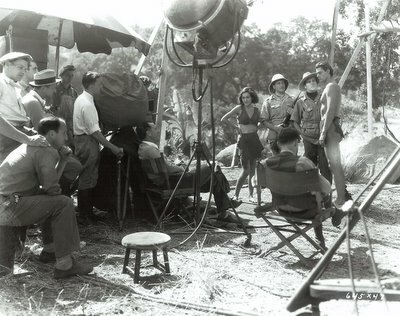 Maybe that’s part of why she eventually quit (can anyone identify the MGM director in that on-the-set shot? We say it's Jack Conway, though we know a number of others assumed megging duties on this show as well). Tarzan pics were never the same without Maureen. Beauteous Frances Gifford was a welcome addition to Tarzan Triumphs, but hers wasn’t the Jane part, and eventual substitute Brenda Joyce was never really embraced by the fans. Ever notice how "Boy" started getting kinda beefy as the forties wore on? Well, so did Johnny, for that matter. As long as he stuck with the series, grosses were predictable as sunrise. 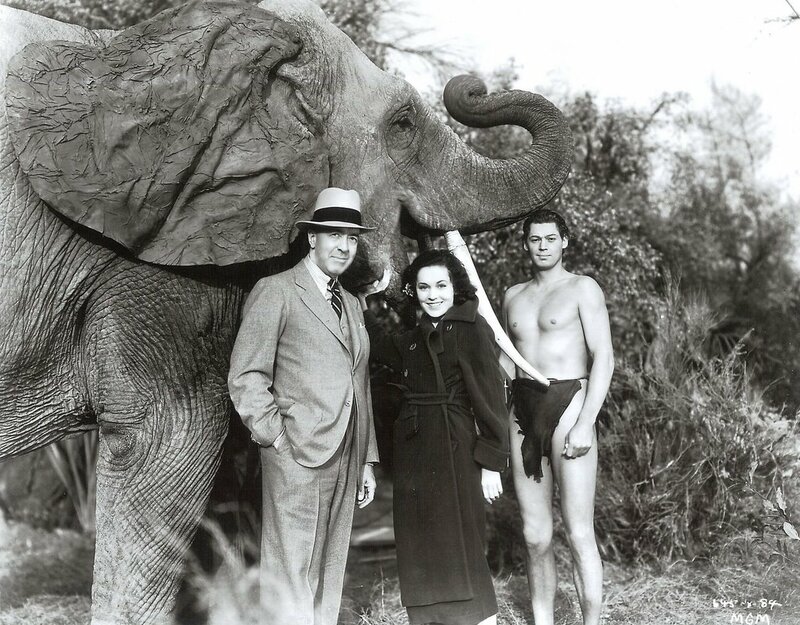 Worldwide rentals for the RKO Weissmuller Tarzans stayed resolutely between $2.3 and $2.6 million (Tarzan and The Leopard Woman was the biggest earner of that group). There was a shocking drop down to $2.0 for Johnny’s last, Tarzan and The Mermaids. That may be part of what took him out of the loincloth, but successor Lex Barker never represented an improvement, money-wise. Tarzan’s Magic Fountain, his first, took a weak $1.8, though admittedly there was an industry-wide slump at the time (1949). Rentals slipped further with each new Barker release. We always liked Lex, but next-in-line Gordon Scott was better. In fact, he may have been the best Tarzan of them all. We consider Gordo's Tarzan’s Greatest Adventure to be an unsung classic. Not only is it a great Tarzan movie --- it’s just a great movie. We look to the day when it becomes available on DVD. Seeing Maureen in the lioncloth (which I would say is NEVER a bad way to start the day) started me thinking about some of her other movies. I loved her in The Thin Man and Day at the Races with the Marx Brothers, although she didn't get a chance to shine as much through all the Marxian antics. Groucho (like any red-blooded American male) had a crush on her. By the way there is a great book out there called Groucho, King of the Jungle by Ron Goulart. It's the latest in a mystery series, featuring Groucho as a sideline gumshoe in 1930s/40s Hollywood. This latest entry features a fictionalized competitor of Tarzan, called Ty-Gor. A fun read. Check it out.